While not used in every fMRI study, a majority of the research currently being done involves some form of auditory or visual stimuli being presented to the subject while inside the MRI machine. Here we'll present just a few of the equipment solutions available at the BIC. 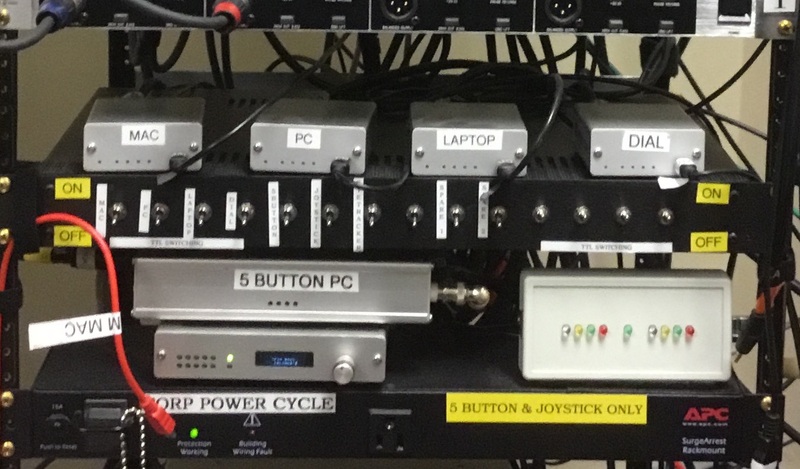 At the bottom of the screen you can find various equipment documentation, including an updated 3 T Peripherals Equipment Guide, which gives a broad overview of what we have available for use. The visual stimuli are presented to subjects using a modified MRI-compatible projector from Avotec that is placed at the rear of the magnet. 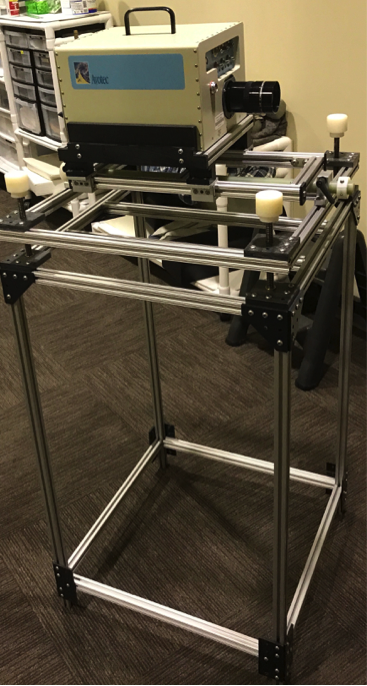 The images are projected onto a specialized plexiglass screen with a non-dispersing optical coating, and the subject views the projected images using one of our custom-built mirror systems. 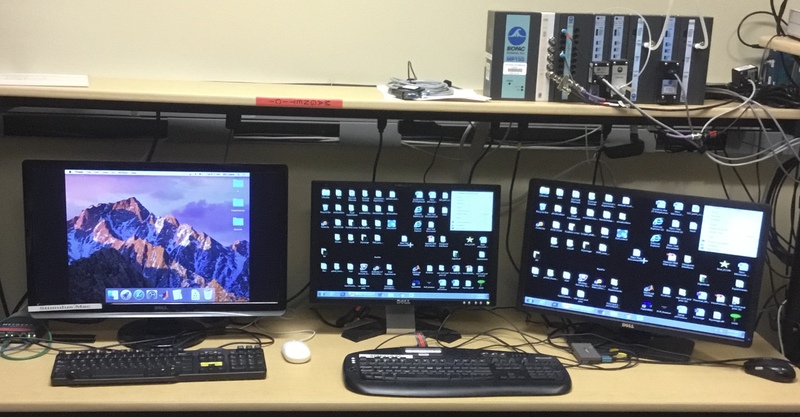 Researchers are able to provide stimuli using a PC (loaded with Presentation and E-Prime 2.0), a Mac (loaded with Matlab 2016a and the Psychtoolbox add-on), or they can bring in their own computer and easily connect up to our system. Our goal is to offer multiple solutions to fit the needs of all our users. The BIC has two auditory stimulus delivery systems available for use; the standard Siemens pneumatic audio system and a custom setup earbud system designed to fit comfortable inside the 32 Ch. head coil. We also have an MRI-compatible optical microphone for recording subject voice responses. Subject responses to visual and/or audio stimuli can be collected using our MRI-compatible response devices. The BIC has several different response devices, including 4-button pads, 5-button pads, and force grip sensors. All our devices are supplied by Current Designs. In case some subjects require prescription lenses to see clearly, our MRI compatible goggles are available for use. The standard goggles can be worn comfortably inside the 12 channel head coil. Using the prescription lenses with the 32 channel head coil requires the use of a custom built adapter that secures the lenses in place on the coil itself. 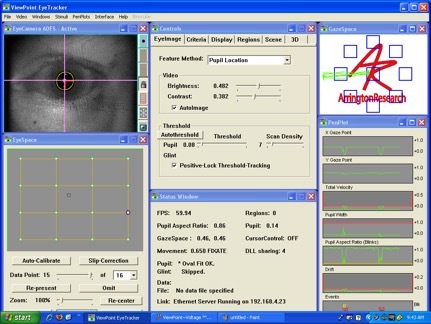 Our older eye tracking setup consists of a camera system from Avotec and software from Arrington Research. We bought an Eyelink system from SR Research a few years ago, but continue to maintain both systems to allow more flexibility for our users. The BIC is equipped with the Biopac physiological monitoring system. With this system our researches are able to monitor and record a variety of physiological information, including EKG, pulse oximetry, respiration data and skin conductance data.